Elegant, white, early Summer flowers, initially striped green, with contrasting chocolate -red centers and mid-green leaves. 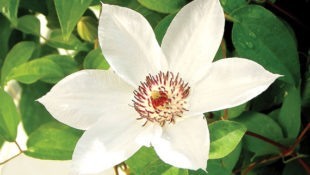 This compact, large-flowered clematis is excellent for growing in a large container or through a shrub or tree. Coping well in full sun or partial shade, it produces a second flush of satiny flowers from August to September.